Too little too late for Hisense? On Thursday, Hisense announced it was releasing not one, but two new 7-inch Android tablets designed to appeal to the budget-conscious consumer. The Sero 7 series was developed as a partnership between Hisense, Wal-mart and Nvidia, and is priced to cut into competitor sales immediately. While the diminutive devices may be a little late to the game, the Sero 7 Pro could go toe-to-toe with Google's own Nexus 7 in terms of performance and value. Of the two Sero 7 tablets Hisense is releasing, the $99 LT model is on the lower end in terms of specs and features. Even though it shares the same 7-inch screen size with the Sero 7 Pro, the LT's 1024 x 600 resolution is immediately unimpressive. There's a definite lack of sharpness, and the more the brightness is turned up, the worse it gets. That wouldn't be so bad if screen brightness wasn't one of Hisense's major selling points. The Sero 7 LT's skinned Android 4.1: Jelly Bean operating system works exactly as it should, and is as easy and intuitive as expected. Even with a 1.6GHz dual-core processor, the LT doesn't have many other hardware factors to boast about. The plastic shell does keep the LT feeling light, but definitely feels like a manufacturing cost decision versus a form-factor decision. Oddly enough, the power and volume buttons on the LT have been placed on the left-hand side, which is the exact opposite of similar Android devices, including the Sero 7 Pro. Whatever the Sero 7 LT lacked in "wow," the Sero 7 Pro more than made up for its little brother's shortcomings. Priced at $149, the Pro is a near identical clone to Google's Nexus 7, but costs $50 less. Both devices share Nvidia's Tegra 3 processor, Android 4.2, a 1280 x 800 screen, and 1GB RAM. The Nexus 7 does have double the storage (16GB to the Sero 7 Pro's 8GB), but the Pro has a 5MP rear camera, expandable memory via microSD and a miniHDMI output. It certainly wouldn't be outrageous to believe Hisense is actually giving you more for less. Like the Nexus 7, the Pro features a textured case, which gives it a bit of a rugged feel, but unlike the smooth exterior of the LT, the Pro doesn't feel as cheap as its price suggests. Both the LT and the Pro feature all the slots and outputs on the top of the device, but the Pro has the added advantage of its microSD slot included a cover (the LT's is completely exposed). When the Pro and LT are turned off, they are virtually indistinguishable from one another. It isn't until the Sero 7 tablets are woken up that you can spot how much better the resolution is on the Pro's screen. We thought the LT's screen was unimpressive on its own, but when put right up against the Pro, the glaring resolution gap is astounding. The two models also have slightly different skins slapped onto their respective versions of Android, with the Pro's focused on the marketplaces like Tegrazone and Vudu, and the LT geared towards Google's proprietary apps like Maps and Gmail. 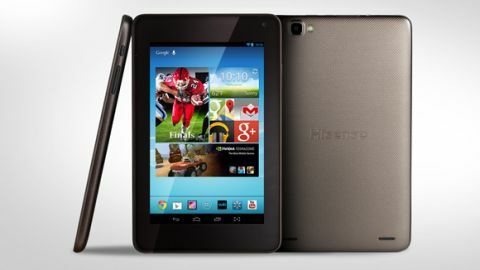 In our short time with both tablets, it was clear the Pro was where Hisense focused nearly all of its attention. The features and specs you can obtain in the Sero 7 Pro for just $50 more make it the clear winner out of the box. We couldn't test the limits of either the Sero 7 LT's 4-hour or the Pro's 10-hour battery life, but again, the Pro more than doubles what the LT can do. That's not even counting the Pro's NFC and Bluetooth capabilities, which have become more synonymous with Android devices over the past year. It'll take a more in-depth look at both tablets before we lay down a final judgment, but at this point, the Sero 7 Pro looks like it could be a definite hit with first-time tablet buyers, or those looking to add another Android device without paying too much.